Campuses Go Green: Colleges and universities take environmentally responsible design to new levels. Describe how the sustainability movement on college campuses expanded in recent decades to include buildings and infrastructure. 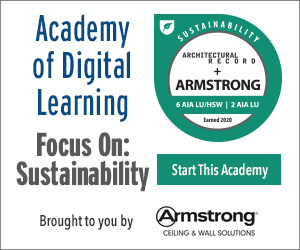 Outline the requirements of green building certification systems such as Living Building Challenge and Passive House. Discuss the strategy for sizing green infrastructure systems and phasing their installation at Chatham University’s Eden Hall Campus. Discuss some of the design and construction challenges presented by the Cornell Tech residential tower, slated to be the world’s largest Passive House building. Over the last 15 to 20 years, the combined energies of students, faculty, and administrators have broadened the focus on sustainability at U.S. colleges and universities to encompass a wide spectrum of concerns. From a start in recycling, raising awareness, and environmental-studies programs, the higher education’s sector’s green endeavors have burgeoned to in­clude curriculum and research, planning and administra­tion, and the many facets of campus operations. 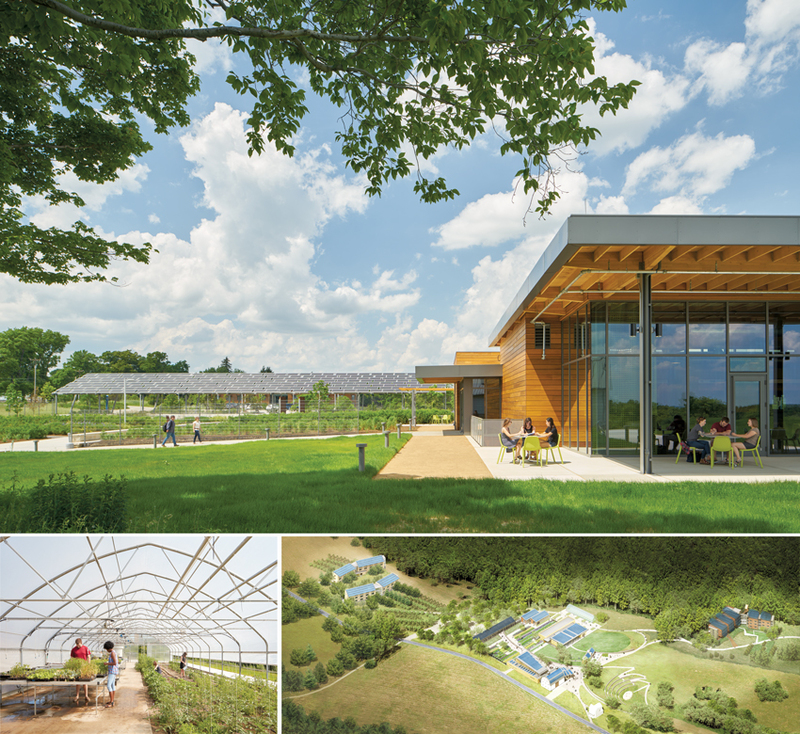 Goldberg’s firm is architect and landscape architect for Chatham University’s Eden Hall Campus, one of the first in North America designed for sustainability from the ground up. Home to the Falk School of Sustainability, Eden Hall sits on almost 400 acres of farmland in a rapidly developing county 25 miles north of the university’s main campus in Pittsburgh. This location presented the project with its first challenge: how to reconcile a greenfield development with the core mission of a school of sustainability. For its answer, Chatham is making the campus into a highly productive peri-urban landscape as an alternative to sprawl. Eden Hall’s site development, including an amphi­theater, native plantings, a greenhouse, and a constructed wetland, are all designed in compliance with the Sustainable Sites Initiative. Its buildings (a field lab, a café, a dining commons, housing, an auditorium, classrooms, and offices) are targeting LEED Platinum certification at a minimum. The first phase of construction, which focused on the core of the campus and was completed last year, has a predicted net energy surplus of 10 percent. GARDEN OF EDEN At Chatham University’s Eden Hall Campus, students conduct varied sustainability-related research (bottom left). The first phase of construction (bottom right), completed in 2015 and designed by Mithun, includes architectural elements that perform multiple functions such as a photovoltaic awning (top) that catches rainwater for irrigation and serves as a sheltered bus stop. An aesthetic of refined functionality with simple volumes clad in metal and wood supports the hands-on program. An awareness of the interrelatedness of systems permeates the design with architectural elements serving multiple purposes. For example, a long stretch of canopy at the campus entrance supports a photovoltaic array, catches rainwater for irrigation, provides shelter to students waiting for a bus, and defines the edge of an outdoor space. Campus gates of weathering steel are art pieces patterned with perforations representing data derived from the geology and hydrology of the site. And, as part of a perimeter fence, they prevent deer from eating the crops. Among the opportunities of designing a campus from first principles lie a few challenges. One of these is the phasing of infra­-structure development: on the one hand, there’s the efficiency of developing energy and water systems for an entire campus all in one go; on the other, there’s the up-front cost of investing in capacity that won’t be used for years. In the case of Eden Hall’s geothermal wells, which provide heating and cooling energy for the buildings, their modularity meant that capacity could be easily added over time. So the geothermal field is sized for the first phase of construction, with associated mechanical equipment, housed in the dining commons, sized for future capacity. The wetland, which provides on-site wastewater treatment, is scaled for what the local regulators deemed necessary for the first phase only. But because the officials took a cautious approach with the unfamiliar technology, the resulting wetland is larger than what Mithun believes is necessary by a factor of three or four. The university hopes through careful monitoring and record-keeping to demonstrate that additional capacity will not be needed with future phases of construction.